Happy Holidays to start. Hope everyone is having a good time. My wife had been sneaking out for a month to work on a secret project and turns out she was doing some woodworking. She made me a canoe oar from scratch, like the old voyageurs used. Really friggin’ cool and amazing gift! Over the holidays my play time is certainly down some, what with the family events. That said, I have both my Sorc and Power Tech at 60 and wondering about what’s next. SWTOR changed a bit in the last patch, where commendations were streamlined. You swap ’em for gear and there are 3 types. Basic, Elite and Ultimate. How you get them is an interesting story. Hard Mode level 60 dungeons only award basic commendations. Hard mode 55 dungeons give Elite. The power curve between 55 and 60 is significant, such that 2 people can easily run a level 55 hardmode. Sure, there’s the odd good drop at the end of a heroic but due to itemization and you already being at 186 in the dungeon, the odds are pretty low. So dungeons are pretty much not worth anything right now. Meaning all you have as group content is raids, which are on a weekly lockout. I’m guessing this is a bug of sorts and a future patch will fix it. In the meantime, I’ll be focusing on other activities. Which for the most part means making credits. I think I’ve made about 10 million since the expansion launched, across both the main players. Artifice isn’t making much money, outside of farming due to the material costs of Midlithe. Cybertech is raking in the money though. That, plus finally maxing out companion faction (gifts) means I’ve flipped for a good profit. It’s funny because I remember thinking that 1 million was a pipedream and here I am sitting pretty. It’s a decent side diversion but I’m hoping for more. I took my Powertech through the Prelude quests and the experience was pretty similar to my Sorc. Mind you, my Sorc has a pretty sweet AE attack and simple rotation compared to a Powertech, so it was more about finding a new rhythm. New set of gear (BIG jump, from ~126 to 168ilvl) and 1.5 levels. I think that’s the largest benefit from the prelude actually, since the first few quests on Rishi give you a new set of gear (complete with pirate hat). 1.5lvls in about an hour’s time is a nice deal. Off to Rishi though. Of interesting note, Rishi has class trainers, comms vendors, tradeskill vendors but no auction house or bank terminals. Auction house, fine. Bank though… that’s a really odd thing. My bags filled up within an hour, easily, especially with an entire new set of gear to equip. I looked high and low, no luck. Perhaps this is the same on Yavin, but Rishi quests are a different mold. Ignoring class quests, as I’ve only see part of one (and it’s cool so far), there are main quests and sub quests. The main plot line is well acted and makes sense. It’s fun. There’s a lot of go over here, then come back, then go where you were but a little farther involved and that’s a bit less fun. What with no transport to get there but your own feet. Sub quests come in 2 flavors, dailies and one time shots. Both don’t have any voice over, just a quest box which you hit accept on. I’m level 58 now, which I found out was a “skill bonanza” level. Every so often in SWTOR, you reach a level where instead of having 1-2 skills to train you have 10. Thank goodness it’s free! I’m a few hours into Rishi, only the first subzone really, of what appears to be 4. The plot is cool, I get to be a badass pirate and ruin people’s day. There’s no skill changes that I’ve seen so far, just bigger numbers. A new solo-flashpoint as well, which was extremely challenging, though for reasons unrelated to my skill. The penultimate bosses, a male and female, jump in and out of this arena with an edge into a lava pit. Of course there’s knockback. Of course my companions will follow these two in and out of the arena. It took 5 tries to not bug out. The last boss, Torch, was a pretty sweet fight. Maybe more of the zones are like this but I found there to be a ton of movement required to get through it. There just seemed to always be a red circle somewhere to avoid. Sorc aren’t very mobile (at least Lightning isn’t so much) so it required a bit of skill juggling to pull off. I can only imagine how that would work in a group setting. I know a lot of games are aiming for more action oriented combat. There’s a fine line to be held here though, as your system needs to support it. And let’s be honest, the Hero engine is a piece of garbage that’s as responsive as a drunk sumo wrestler. FF14 was smart enough to put in a 2.5s GCD to combat the server lag. SWTOR balance is going to need some work to not make too onerous for the players. More pirate work to go. More explosions too. Given that I had only subscribed on Nov 7th, I missed the first week of the Shadow of Revan expansion. Good news is that I saved about 500k in credits in that week as now skill training is free. I wouldn’t have minded a nominal cost but training costs from 1-55 are (were) huge. You started the expansion broke, for the most part, unless you were a fairly active player. Heck, you needed to be a subscriber to have enough credits in the first place to pay for it all. Which rolls into the part I think SWTOR does well, and that’s introduce new content and smooth our the power curve. There have been 2 leveling plateaus so far, one at 50 and one at 55. The current leveling process works up until 50 but the Makeb portion was punishing without the right gear. If you were just using leveling gear, you’d be behind by 50-70% in terms of stats. So Makeb now has a GSI buff which makes sure you have the stats to make it through. And if you complete the content, then you’re given the gear for a pretty decent 55. Smart. The SoR expansion also does this, as they’ve assigned the baseline to a certain gear level. If you don’t have it, then you can do some solo flashpoints (the Forged Alliance quests) and get a full set of top level 55 gear to get you ready for Rishi. It’s a great bridging mechanism that allows players new to the game keep pace on the stats treadmill at all times, without massive peaks and valleys. Before the WoW stat squish, every expansion had massive power jumps between them. There are mechanics in SWTOR to mitigate it, which is smart. The flashpoints themselves are cool, as I never had the chance to do them previously. You’re given a GSI droid who can DPS/Heal/Tank and makes it rather hard for you to die. Everything outside of a boss was a faceroll for me (though I was in gear better than Makeb quality) but it was a cool experience nonetheless. Each boss had some interesting mechanic – shield swap, stuns, massive telegraphs, movement debuffs. As a mechanic, I think this is pretty neat. There’s something to be said about soloing old dungeons and challenging yourself. The droid they give you simply allows for you to experience the content without that challenge, assuming you came in a bit late. I mean, I realize it’s simply a bridge and won’t be applied to other dungeons, but there are possibilities here. Old operations come to mind, as the power scaling in SWTOR is a fair bit different than say, WoW. The story around these flashpoints is pretty neat too. It’s split into 3 pieces, and I’m not sure if there was an original delay between them all. I won’t spoil too much but suffice to say that Forged Alliance is pretty obviously an alliance between the Republic and the Empire. It’s all a setup piece for the expansion, so there’s a cool reveal at the end with Revan. A few characters are introduced during the run, including a pretty funny combo of a wookie and droid meshed together. There’s only a single decision point in all the 3 quests that seemingly would have impact, so I’m curious as to how that rolls out. It really is something when you play a game and you’re the central character. The final cutscenes in WoW lately have been other people. Heck, my Alliance Monk’s final scene in Nagrand was 2 orcs fighting each other. My character has never spoken a word. It’s like watching a movie for the most part. I think that’s why I like garrisons, cause I’m the focal point for once. SWTOR scratches that story itch something fierce. And for those who say you can only do a story so many times, I think that depends on the quality of the story. The “choose your own adventure” books, I’ve read hundreds of times as a kid. I’ve watched Blade Runner and Fifth Element at least a 100 times each. LOTR books/movies I’ve done a ton of times. Golden sci-fi, Hitchhiker’s Guide, Star Wars (4-6), Futurama…plenty of stories where I’ve enjoyed the experience multiple times. SWTOR really has a story quality issues. Some portions are amazeballs but they are not the typical story. I really enjoyed the 12x boost because I could focus only on the quality (-ish) stories, the ones where the most time was invested. I didn’t have to kill 10 bears. I’m enjoying my time and that’s all that really matters. Safety Note to start the post. Be smart, don’t tailgate a vehicle that you can’t see around. My bus got rear-ended by a car today. The bus won. It will always win. Day 6 was better, so I’ll start with SWTOR first. Today was credit making day. Given that I’m only able to run a single session of crew skills, what with them each taking 20-30 minutes, it was a cycle session on the GTN. I found a few items that didn’t sell, namely items in the 47-55 range since Makeb/Oricon replaces it all. It’s funny how a level 46 item will sell easily and a 47 won’t get the light of day. I also remembered that my older characters had bank accounts. Bank accounts full of materials. Materials that are worth credits. My Sorc and Powertech both hit the 50 GTN cap well before the bank was empty. My Operative and Juggernaut are still rookies though, so the bank is relatively empty except for legacy/custom gear. Side note, weapons in SWTOR, while customizable and quite unremarkable. Which is an odd contrast to other games with customization. Reminds me a bit of the Esper in Wildstar, where the weapon is an afterthought. SWTOR does have the best looking gear though. That stuff is sweet. My Sorc 3 days ago was at about 700k. He’s at 1.2m now. I think I’ve made about 1m across them all, which gets me closer to the Tatooine stronghold. It’s nice to have a goal. All this working up to Patch 3, the Shadow of Revan expansion, which I should be more than prepared for. Side note for a future post. I am confused by the Dev Blogs for SoR. The goal of the expansion (in particular disciplines) was to get rid of skill bloat and hyrbridization (it’s now a word). That the dev blogs are introducing new skills that supercede old ones is conflicting. Not a new skill that’s standalone – a skill that replaces an old one. I’ll get into that closer to release. At 7:30 the queue was just short of 2000 but dropped relatively quickly – 45 minutes or so. There were only a dozen or so servers with queue times based on the realm status page. Area52 and Stormrage the only PvE ones as well, at least from what I could see. Once I did get in, the server was relatively stable with only a few lag hiccups. I was in long enough to complete Gorgrond. Shadowmoon Valley kicks off the campaign for the Alliance. It’s an decent story of the Draenei foothold in the lands, their massive attack by the horde and some cool sacrifice/birth of a hero substory (Yrel is neato – the only female lead I’ve even heard of in this expansion). It’s very intro-based and the zone is open enough to have a view of everything. The zone starts with orcs, goes to a bunch of animals that are poisoned, then finishes with orcs. There’s a scenario of sorts to finish the zone. Gorgrond is half about orcs and half about poisoned natural folks (a theme maybe). You get to meet some Gronn as well. I read all the quest text but it had nothing to do with anything outside of shamanism (you resurrect what appears to be a demi-god) until the last scenario quest. That one was all orcs and you take on attacking a huge base. I died. A few times. I could have just stayed back and let everyone else manage it. Yrel was there and the demi-god. I didn’t get the point of this story at all. The outpost was a Lumber Mill which gave me a giant shredder. The thing did no appreciable damage but did let me find some garrison resources, so yay? 2 zones in, level 94 now. Can’t figure out what perks I’ve gained, though it almost appears as if they reset every log on. I’ve gotten the improved chi(?) 3 times now, since every time I log back in I’m at 5 chi. I am of the firm opinion that random perks while leveling is a stupid mechanic. Garrison is still a tossup for me. I upgraded my mine for 1000g. Ore sells for about 6g per, so 3 days or so and I make my money back. My follower missions are annoying, with only a single interface point per zone. What happens is that when I get to that interface, all of them have completed, so there’s no actual decisions to be made about who’s going on the mission. I see what’s there, it automatically sorts on who’s best and I just assign from the top down. My 2 year old daughter plays more complex games. 94 and still haven’t figured out how to get a follower with me in the field. I cut trees to get more resources, to do what exactly? Run more missions? I mean, it’s polished to high heck and you have decision points while leveling but it doesn’t yet have any real impact on the game. I get 5 different quests per zone. Whoopie. I think the thing that annoys me the most is the complete lack of customization. I can’t put trophies, or medals or items that represent my progress in a zone. All I get are followers, who I can’t actually see outside of a menu. So far, my experience is one of high polish but no depth. And I’m simply a stone skipping across the surface. Day 5. Kids were tired so I was able to start WoW at about 7EST. That had a queue of ~2400. I just left it open and played some SWTOR in the meantime. I think it was about 10pm when I could finally log in. From the garrison to any other flight point gave me an error that the instance could not be loaded. It also told me that the world server had crashed. Quit that pretty quick. Good news is that I have 5 more days of game time, so yay? We’ll see tonight but from what I can tell, there are still a few dozen servers that are in the red. I had mentioned that I cleaned out my bags and re-focused on making some credits right? Well, the previous night’s purge gave me about 500K in sales. I collected my crew skills, assigned new ones, posted on the GTN and then moved on. To a Jedi Knight of all things. I’ve heard that a Knight and Smuggler are somewhat on par in terms of story quality and I have an odd dislike for the Smuggler (due to the IA), so knight I went. Funny story actually, as I had played a knight in the beta, so there were quite a few spots that were a sort of déjà vu feeling. I had tried to do a few of the Tython quests in addition to the class ones. I completed 1 of them total, due to the way the items and drops were spread out – which I remember as being a grind issue back in beta. See, while leveling my other characters, I tend to pick up the nearby quests. Incidental completion means free credits, exp and sometimes gear. If a quest was above 75% complete, then I’d take the time. If it wasn’t, then I’d drop it. This was if it was even in line with where I was going. So assuming the quest was in the path, I’d say about 50% or so could be completed. Makeb was more like 100% but that’s an odd one. That I only did 1 on Tython was odd. So I leave Tython at 11 and completed Coruscant by 20. I was leveling at a crazy pace and it was hard to keep a trainer nearby to stay on track. Eh. I also wasn’t paying a ton of attention and forgot to get my advanced class after Tython and only did it at 20. You forget about the playstyle differences between the classes. I opted for a DPS only knight (sentinel), who from what I hear is the highest DPS class in the game. We’ll see how that runs out. Story-wise there’s not much to report. The decisions given strongly push you to light side. The dark side choices aren’t evil per-se, just a strong push for an emotional response. Feelings lead to the dark side I guess. I do find it funny to be called “the strongest jedi ever met” and I’m only level 10. I’m fighting apprentices and masters like it’s a big deal. From a story perspective, I get that line of thinking. The level is an MMO mechanic, so that a level 10 sith master is technically weaker than a level 54 frog, but lore-wise it’s the opposite. Story closing Tython and Coruscant is 2 folks who turned dark (or were always) and I hunted them down. I’m the jedi police. Balmorra is next I think. I took slicing to get some cash while levelling. The speed of progress meant that I was too low level to pick up boxes in the sewer portion (there are like, 50 friggin’ lock boxes there) but I’m good now for the next planet. Companions are ho-hum, with a droid and a jedi padawan at my side, neither of which has much of a character to speak of. I hear the story gets a lot stronger later on, in particular when you get Scourge at the tail end. Looking forward to that. What’s neat is that when my night was over, I logged into my Dromund Kass (Empire) stronghold with my jedi. I think it’s a smart thing to have a single house for all alts. Quite a few games support this today, or at least access from an alt to a main’s house. SWTOR isn’t super alt friendly, but with legacy perks, collectible gear and strongholds being shared, it’s a solid step. In which I posit a theory that analytics predicted the issue with queues. First off, the playerbase over time debate. 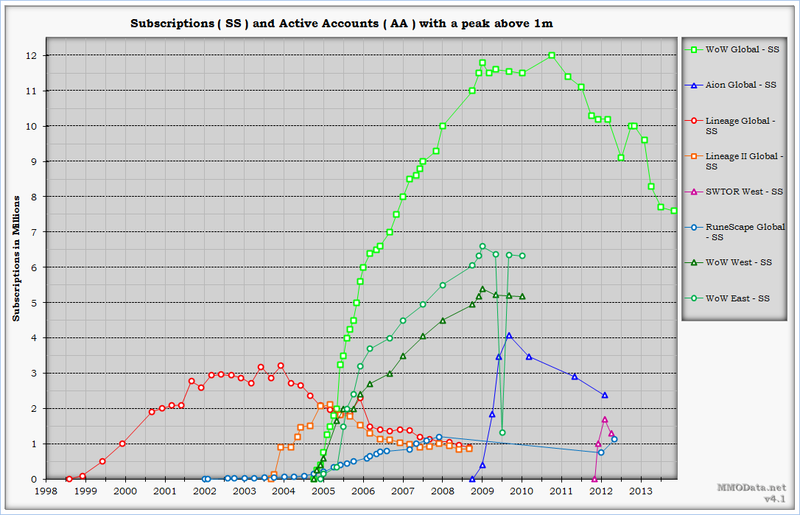 See subscription numbers, vs Expansion dates. Data points for 2014 are in. There’s always an uptick a few months before an expansion. One measured in millions of players. WotLK had a great launch and then went flat. Cataclysm was not favorably seen by the majority of the playerbase and has had the largest drop. There was never an uptick. And this is when you got D3 for free if you subbed for a year…which is the flatline. MoP had a decent launch but suffered a massive drop that eventually stabilized and had an uptick. There’s an uptick pattern for WoD. Specifically for populations on servers. 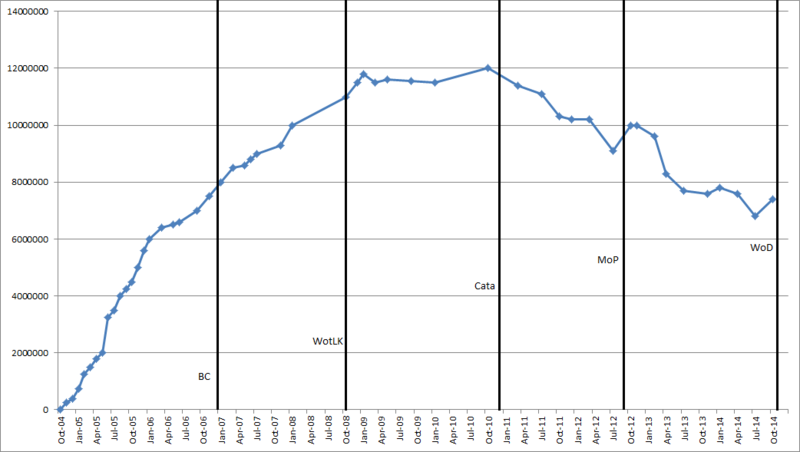 That said, given that there haven’t been any server closures, there are ~40% less people playing than at peak in WotLK. Blizzard’s method of merging is called connected realms, which puts two more servers together in order to balance populations. Some realms have never been connected and have always had high populations. Stormrage is the Alliance server, Area 52 the Horde one, where the ratios are extreme variants (95:1). PvE specific. Due to flying since BC, open-PvP in WoW is more or less dead, making PvP servers redundant outside of a) ganking and b) timeless isle. (My thought is that TI was a test base for no-flying in WoD, in particular the PvP implications). PvE servers are Alliance favored, PvP are Horde. All this to say that servers have high concentrations of players of a particular faction and that this trend has increased overtime. e.g. Alliance players will tend to move to Alliance heavy servers. It’s a funnel effect. All that data to say that patterns indicate an uptick of ~1 million players. Those players would be concentrated on a specific set of servers and that those servers are faction-weighted. The “queue cap” if you will, seems to hover around 150,000 players (not absolute but scale), with quite a few servers containing many more players. Actually, it was closer to 100,000 at WoD launch, then was raised over the weekend. Fixed sever sizes and allocations are not feasible with such large swings between the servers. Dynamic resource allocation (think the Amazon Cloud) is about the only way to manage this type of problem. Connected Realms do a bit of this. Instancing all of WoD does this as well. However, the scale of this instancing has yet to support the servers with > 200,000 players. They have stated that they want to address that this week. For clarity, this isn’t a hardware issue. It’s a service issue. Building a cloud like service with 10 year old tech ain’t easy. Heck, it’s hard with 1 year old tech. My issue isn’t that the solution is complex, readily agree. My issue is that the evidence rather clearly pointed to this problem (and could address a lot of the population issues) if more efforts were put on it. Though, knowing Blizz, in crunch time they tend to align with polish rather than below water tech. After all, most people will forget about this in 3 months and complain the servers are empty again. In an ironic twist, this is pretty much what SWTOR has in place, though that game doesn’t have seamless phasing between instances. From that segue, I completed the Imperial Agent storyline due to the 12 hour queue in WoD. I was pleasantly surprised at the final twists. I thought it was a bit odd for the final decision to be done through proxy and that the choice, while in character, was likely not the one considered canon. I decided to side with the Empire and serve the Sith, rather than intelligence proper. Still, a fun and solid story, by far the best of the bunch so far. And with a better understanding of talents and power, the use of stealth made each mission fly by. I bought the apartment on DK for 5,000, just to get an idea of what to expect. I’m not poor, with somewhere around 3m across the 4 characters, but decided to hold off the Tatooine investment for now. Placed some items, completed the quest, got some conquest harvesting items too. Looks neat, though it’s more akin to Lego than a freeform service like Wildstar or Rift. Finally, I decided to try my hand at improving my financial position. That meant emptying the bags on the GTN (auction house). That’s been somewhat fruitful. Looking at the long game though, I wanted to see which tradeskills turned the best profit. Suffice to say that crafting items seems to turn a fair bit less than simply selling the base materials, at least for now. And that the sweet spot of cash making is not in top tier material. In my traditional ways, I have a spreadsheet of all the material I can dig up based on my gathering tradeskills. Some are clearly more profitable than others. So much so that my Sorcerer, while completing some GSI missions on Makeb, ran a few crew skills and has a potential profit of 300,000. My other 55s are all running their own as well, with 2-3 minutes of work setting up about 50,000 each of sales (log on, collect previous skills & GTN, post new items, assign new skills). I am hesitant to spend any of the credits on temporary items, such as gear, given that the expansion is 2 weeks away. My 140/156 mods are more than enough for now. So for now, I’ll just run crew skill missions and see about getting a Republic character off the ground with the 12x boost.